When we're on the road for a long time like we are right now with this 70 Day Road Trip, I have to get a little more inventive than regular old burgers and hot dogs. That being said, I also do not enjoy cleaning a greasy dirty grill each night before we can pack it away in the van. So, for most of our trip, we rely on foil packet meals, which are meals where all of the ingredients can go into a packet made of tin foil and cook together. When you are done eating, just throw the packet away. No dishes to do and no grill to clean. 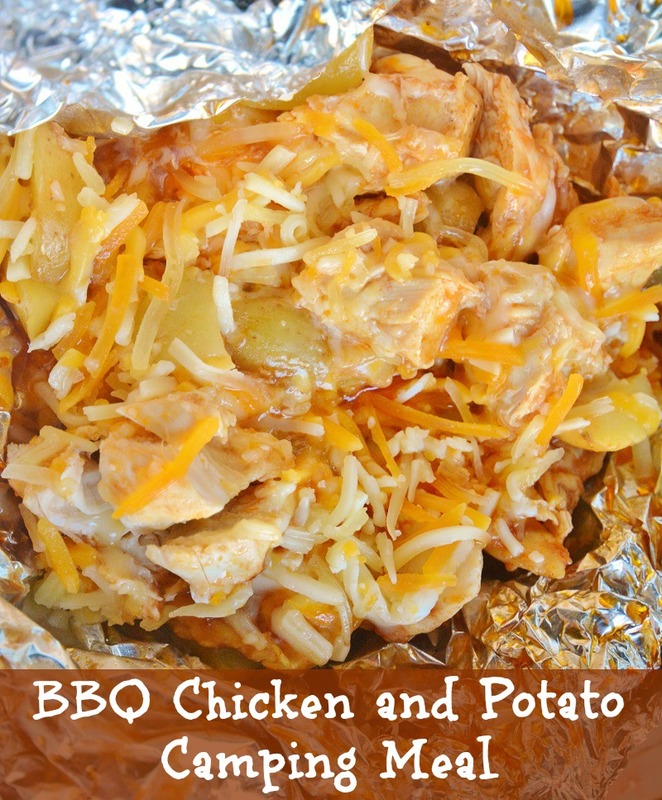 This BBQ chicken and potato packet is a family favorite. Step 1: Cut the potatoes into small pieces and place evenly into 5 foil packets with some olive oil, salt and pepper. The olive oil keeps the potatoes from sticking to the bottom and burning. Step 2: Fold the packets up, leaving a bit of room at the top for steaming and close the sides tightly. Cook the potatoes for about 15 minutes. Step 3: Take the foil packets off the grill and open to add 2-3 chicken tenderloins and as much BBQ as you like. I usually add a few squirts to each packet. Step 4: Close the packets up again and cook for an addition 15-25 minutes. Take one off the grill and check the chicken periodically. Step 5: When the packets are done, add a few pinches of shredded cheddar cheese to the top, and serve. Looks yummy, my son can so do this!! Happy Mother's Day!!!! I don't need to go camping for this one. It looks delicious! Yummy, my kids would enjoy making these on campfires (I'd bet they'd work). You never cease to amaze me with your cooking and the fact that you can blog while you are on a road trip! Thanks so much Zoe and Lory! Mmmm, even for backyard cooking, this looks mighty fine! Easy delicious comfort food is always a big win around here. Although we don't have a camping trip planned, I would love to prepare these on our backyard grill. Sounds easy and delicious! I pinned it! My boys will eat well when we take them camping for scouts! this sounds and looks really delicious, thanks for sharing this. Im going to try this in the oven. I don't go camping or grill.